It is exceptionally disheartening that Biafran political elites are yet to decipher the destructive fire encroaching into their domain. This statement of concern is born out of the callous arrest of some Biafran agitators which allegedly disrupted the political meeting organized by Eastern Consultative Assembly (ECA) which held in Enugu on Tuesday 27th February, 2018. This is another disguised method adopted by the Nigerian government in its desperation and frustration, to pitch the ECA leadership which is the only surviving organization in Biafraland that is enjoying the respect of Biafra youths and the Indigenous People of Biafra (IPOB), since the South-East governors and Nnia Nwodo-led Ohaneze Ndigbo (Igbo socio-cutural group), respectively rubbished their reputation, to service their Hausa-Fulani (Arewa) slavemasters. It is worthy of note to state here that the supreme leader of the Indigenous People of Biafra (IPOB) worldwide, Mazi Nnamdi Kanu, still remains the current Chairman of the Eastern Consultative Assembly (ECA) even as he is yet being held incommunicado in an unidentified secret dungeon of the Nigerian army since 14th of September 2017 after his abduction from his invaded residence. Politically minded organisations in Biafraland should know therefore that the only language understandable to the Biafran youths in this season is nothing short of BIAFRA REFERENDUM. The entire Biafra citizens except for the few political predators/sycophants have unequivocally declared before the global community, that they disdain and abhor anything Nigeria including political participation and the so-called RESTRUCTURING. 1) Addressing the mammoth Biafra crowd that gathered in the meeting as "the people of Eastern Nigeria by an erstwhile minister of the Nigerian government, instead of "the people of Biafra". 2) The immoral promotion of the political ruse called "Restructuring of Nigeria" by a speaker. It should be clearly stated that the Biafran people the world over, have unanimously rejected any idea of Nigeria restructuring but rather, have openly and unmistakably shown genuine desire for uncompromised restoration of the Biafran nation. This is where these sycophantic politicians in Biafraland are totally getting it wrong. They should know and promptly too, that uncountable number of Biafran youths and men languishing today in various detention cells across Nigeria, are not victims based on their quest for Nigeria restructuring. It was not because of this that the Nigerian army was instructed to murderously invade Mazi Nnamdi Kanu's residence, kidnap him and hold him incommunicado since 14th September, 2017. It was not because of this that the combined team of vampiric Nigerian Army and Police have killed, maimed and incarcerated hundreds of Biafra agitators since 2015 till date. It is therefore foolhardy for these politicians to like the proverbial ostriches, bury their heads in the sand while exposing their bodies to destruction. The earlier they read and understand the handwriting on the wall, the better for them. They should wholesomely jettison being used as tools of destabilisation and dissent against the overwhelming demand of their people as if the Biafran youths are at war with their elders. The youths of Biafra have no grouse against anyone except those who stand as saboteurs to inhibit their only just and essentially uncompromising demand for an unfettered Biafra restoration through a peaceful and acceptable referendum. It is therefore imbecilic, and mischievous for anyone to describe the disruption of the ECA meeting by Biafra agitators as a rebellion against the elders of the land. The action of the agitators was a timely interventionist call for redirection and focus. 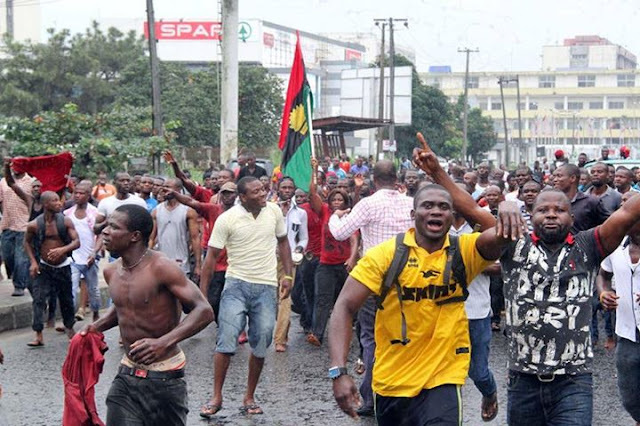 The Biafran youths have never in any known record, physically or otherwise, assaulted anybody or destroyed properties including even the politicians' whose views and pursuits run in sharp contrast with the general demand of the people. The Biafran youths who have maintained high degree of discipline and decorum against every act of Nigerian government's provocation, hereby call on the Enugu State Police Command to without further delay, release all the Biafran youths arrested and held in detention since the ill-fated meeting. Voicing out their rejection peacefully against political tyranny and anti-people agenda as sponsored by the agents of the Nigerian government, is never a crime known to law. All we need is referendum to determine our nationhood and anything besides this, is totally unacceptable.